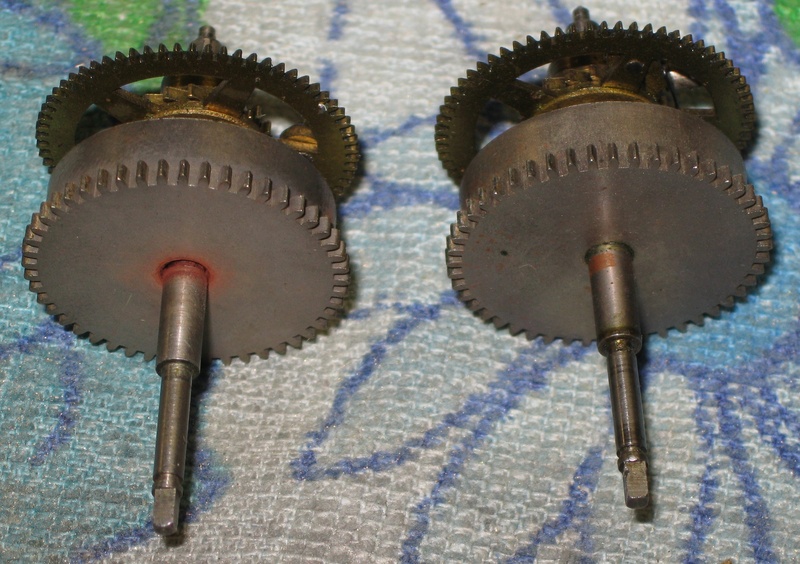 I replaced the following badly worn parts: C1 (chime main arbor), S1 (strike main arbor), chime mainspring barrel, strike mainspring barrel, strike mainspring (rusty and broken), T5 and T6 (time gears number 5 and 6). T5 had the tips worn off the teeth, T6 had bad tooth wear. This clock uses the reliable Sangamo motor. I cleaned and lubricated the motor, and it runs very quietly. 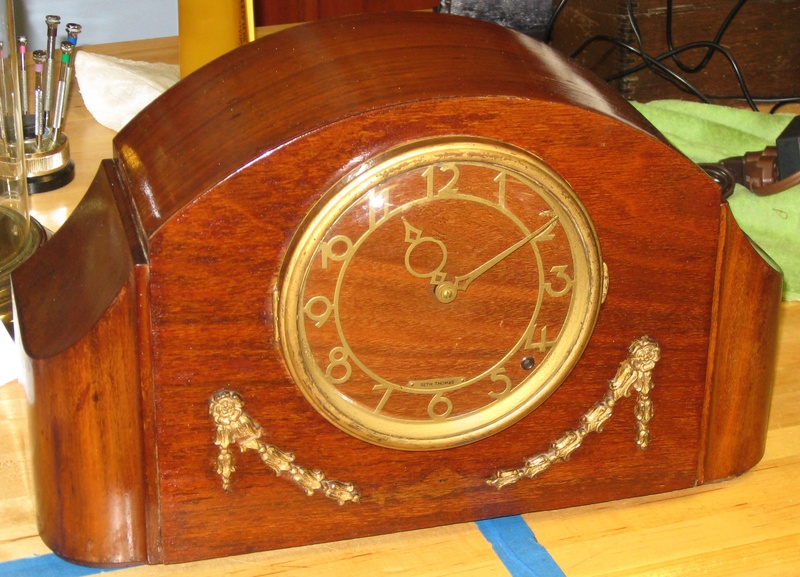 See my post Seth Thomas Falcon Electric Clock, Made in 1940 for photos of the Sangamo motor. Job 6381. I polished the pivots and installed 20 bushings. This movement is like a Seth Thomas No. 124 movement that is electric instead of windup. 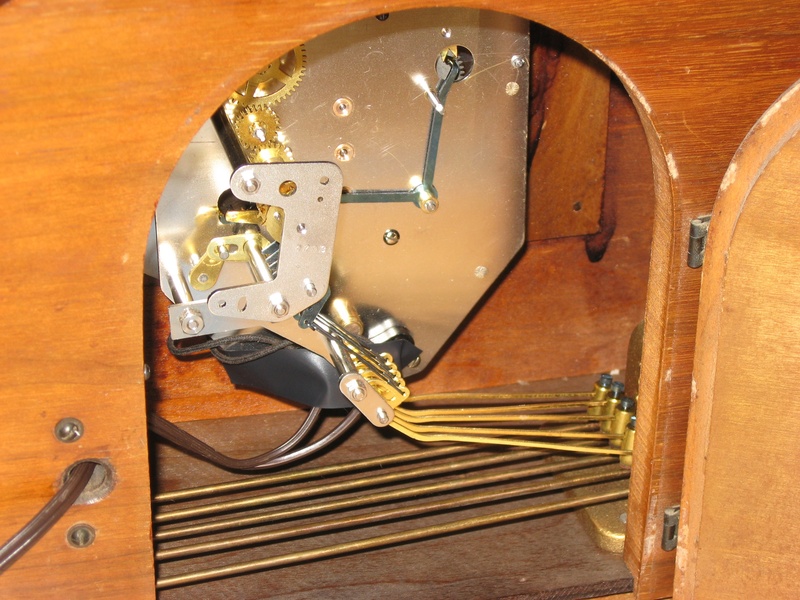 The motor continuously winds two small mainsprings, one for the quarter-hour chime, and one for the hour strike. Each mainspring has a brace end that lets it slip around the barrel so it won’t overwind. I adjusted the braces so that the strike mainspring winds 7 turns before slipping, and 6 1/2 turns before slipping for the chime mainspring. Around 6 to 7 1/2 turns is good. If the spring winds fully before slipping (9 or more turns) it will put excessive pressure on the gears. These old Sangamo motors are great! The only weak point is the wires – the attachment to the coil is fragile on some, and they can break off. 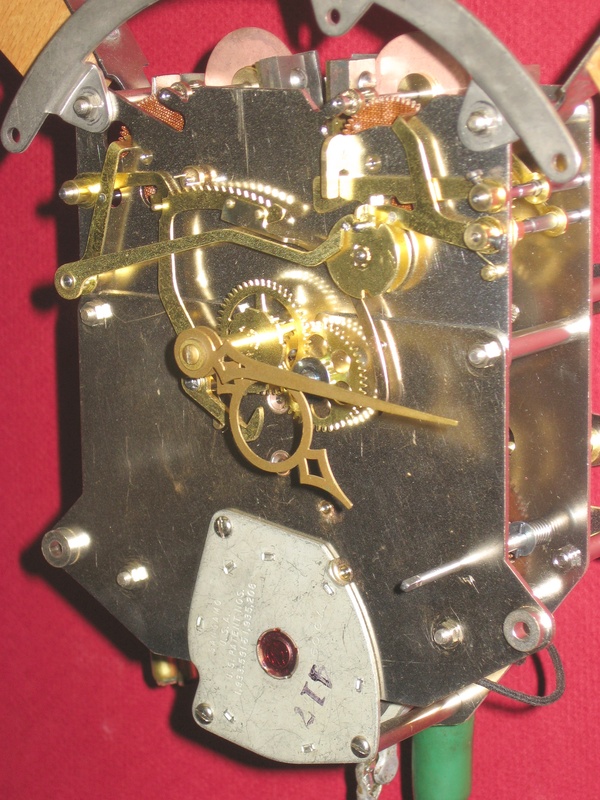 The movement has the date code 1-49 (January 1949). Previous Seth Thomas Giant No. 3 Oak Kitchen Clock in Many Pieces! Have the same movement different clock style. Hour strike spring is broken any idea where I can find one. thank you. Thanks for this post, Bill. Can you explain the function of the discs at the top end of both gear trains on this Seth Thomas? And the relationship with the metal notch that is mounted to the back plate within which they rotate? Also, did you use the same brass bushings that you would use on a spring driven clock? Thanks.